We have quite a large set of updates this month, and Andy has already started on the uploads. More later on what’s new, but I wanted to start off by highlighting one little change in SP. The summit Ostrzyca Proboszczowicka, had originally been listed in the BP region as SP/BP-007. This was not right. So, Andy cast some SQL spells and the summit has now become SP/SZ-011. The clever bit is that Andy’s tweak has brought all the original activations with it. So your past activations/chases of SP/BP-007 have now become activations/chases of SP/SZ-011. Also there have been changes to RMs in many associations. I still have some problems (missing summits) in the HB9 association that I hope to resolve today. As usual, I merely get the data into the DB, the real work is done by the AMs, RMs and the summits team. So please join me in thanking managers who have retired, new managers who have joined and everyone else who has worked on these changes. In addition to the summits and association data updates, I have tweaked a few features on the DB app. Aggregated associations updated to feature All LU and All PY as these countries will feature multiple associations. Dropped the association name from the AM reports filename. So England’s report is now G-activity.csv and not G - England_activity.csv. Unicode file names work on both WinServer-2012 (where the DB runs) and Linux (where the files are made available to everyone), unicode names do not work when the files are zipped and transferred. This is the second part of our update to EA4, using 5-m horizontal resolution LIDAR data from IGN, Spain’s national mapping agency. 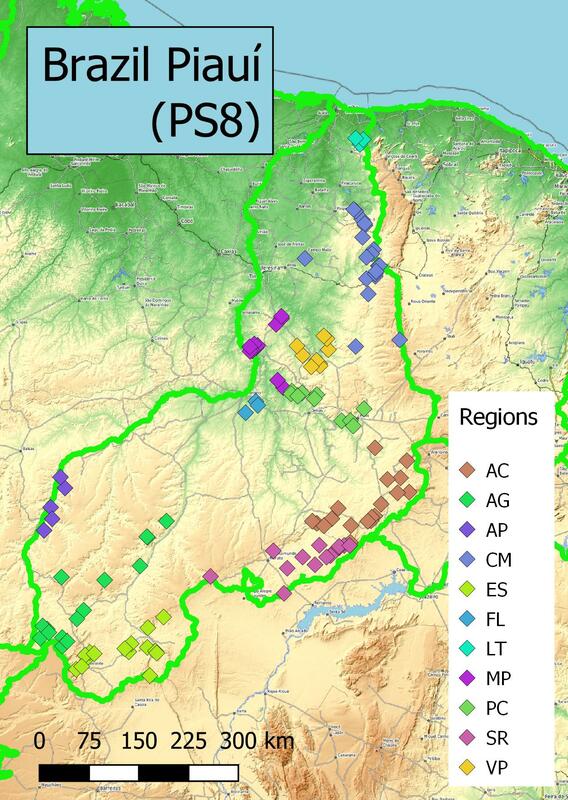 Last time we identified 15 summits that were subsidiary to higher points and set them to retire at the end of August. Their replacements are now on the system, and we’ve set these to start on 1st September. So you’ve still got a month if you want to activate the old positions. The 327 other new EA4 summits will be live from 1st August. Many thanks to Moises @EA4MZ for assisting with the update. Welcome to AM Ronaldo PS8RV. With assistance from Pedro PR8ZX we’ve got 122 summits listed here. We have several more Brazilian associations in the pipeline. The LU team now have another association, with 36 summits (building up to the big ones!). We should have ARMs on-line shortly. This stems from an enquiry we received about activating the last unclaimed (for climbing) US county high point - the volcanic summit of Agrihan Island in the Commonwealth of the Northern Marianas. Sadly this attempt had to be postponed, but we’re listing all the summits anyway. Activating any of the unpopulated islands would be sure to be a major undertaking (clearing a trail, &c) and any of them will likely throw up other issues. We’re grateful to Todd, KH2TJ, for taking on the AM role. Todd has also taken on Guam, which has 3 summits. A few more tweaks in the data from the updates. Well done everyone - it’s appreciated! It’s my understanding that Simon takes care of producing good ARM’s, while Andy does his best to map data from different ARM’s into the corresponding database tables and records. Now, my question is who is in charge of correcting possible inconsistencies? A quick look at sotamaps popup windows (which reflect the database settings) shows that the minimal height for bonus points is set to ≥ 1400m ASL. Would somebody please correct this. BTW, I was told that E7 SOTA was initiated by two Slovenian (S5) guys, who apparently copied the Association Reference Data table from the S5 ARM to the E7 ARM. Now, it may or may not be a good approach. I hope the MT will reconsider data in the Bosnian ARD table during the next review of the E7 ARM and make it more consistent with General Rules rather than Slovenian specific data. And, yes, S5 ARM should be reviewed, too. It contains some statements inconsistent with General SOTA Rules. Zoran, the points that you raise here should be made by PEM to the MT, that way they are more likely to quickly be directed to the attention of the appropriate people. With regard to the specific point raised about bonus points, in my opinion the ARM is the reference source and any conflicting details elsewhere should be ignored. You are right, Brian. Is there a group email address for all members of the MT or I should write to any member of the team? No… definitely a local who I believe is still a resident of Sarajevo. I remember the inception of the E7 association very well. There is a contact page on the website (SOTA Home on the Sotawatch menu) but also if you go to the About SOTA page and scroll down you can get contact with individual MT members. Probably best to use the contact for all members where the matter concerns more than one of them. One more 1st August new summit to bring to your attention, especially OM and SP ops. Rysy, OM/PO-092, 10 points, has its true summit just on the OM side of the border with SP. However, according to data on peakbagger.com there is only a 9-m drop off Rysy North Peak, itself a little over 3m lower, before rising to the high point. This puts the North Peak in the AZ. So why is this notable to SP ops? Rysy (North Peak) is the highest point in SP. Taking care over the AZ, activate using the OM ref and adjust your call sign according to which side of the border you are. Many thanks to Juraj @OM1DI for assistance. Mexico South (XE3) association has been added to SOTA this month. 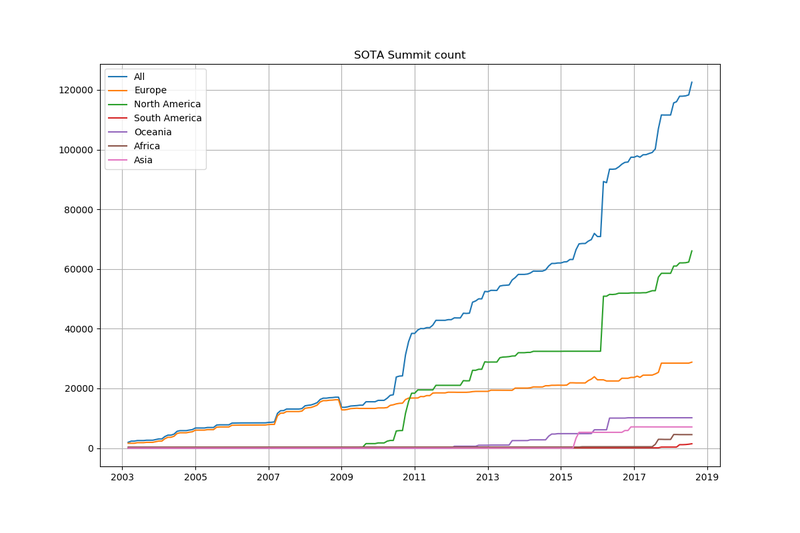 A total of 3383 new summits into the database. Also a new region was added to Mexico North - Tamaulipas with 339 new summits. I thought that was Alaska? Sorry, I meant to say was that XE is the biggest contributor to this month’s upward step.